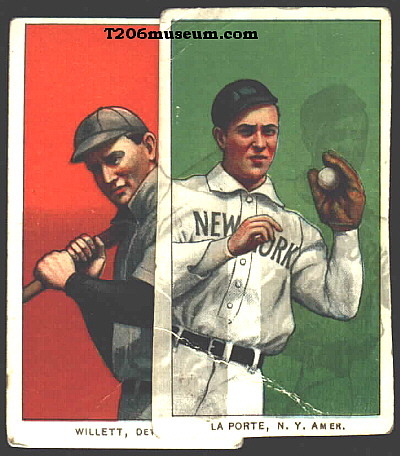 The card presents here is a T206 Frank LaPorte with very rare overprint error. This LaPorte card has a ghost image of his black printing to the right of the main image. The other black printing to the left of the LaPorte ghost image is Ed Willett. This 2-IN-1 overprint error gives us more understanding of T206 printing process. It provides solid evidence some population of T206s were not repeatly printed horizontally with a same image. This type of overprint error is rarely seen and this is the only known LaPorte specimen with Willett overprint. 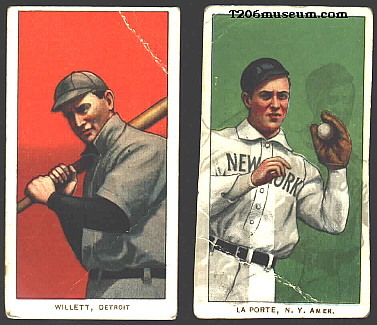 Both poses appear in the same 350 Series and this LaPorte error has a Piedmont back.